Gov. 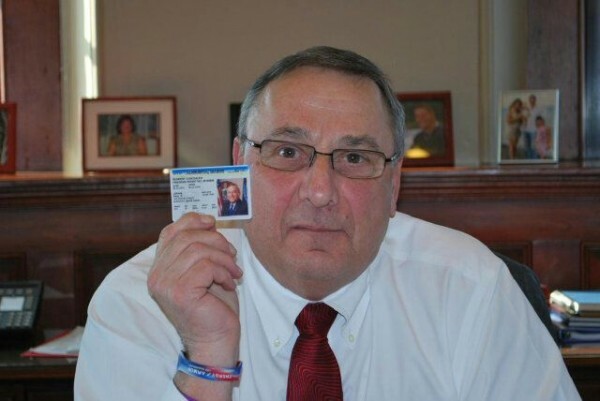 Paul LePage displays his concealed weapons permit in this photograph released by his office on Thursday, Feb. 14, 2013. AUGUSTA, Maine — Gov. Paul LePage on Friday teamed up with the assistant leader of Senate Democrats on legislation that would temporarily block the release of personal information about concealed weapons permit holders while lawmakers work on a permanent measure. LePage on Friday said he submitted emergency legislation after the Bangor Daily News’ statewide request this week for the names, addresses and dates of birth of all concealed weapons permit holders in Maine. The BDN on Friday withdrew its request for that information, which the newspaper sent to law enforcement agencies across the state. Sen. Troy Jackson, D-Allagash, is sponsoring the measure, which would take effect immediately if passed by both chambers of the Legislature and signed by the governor. Although the Bangor Daily News withdrew its request for the weapons permit information, the Maine State Police on Friday received a Maine Freedom of Access Act request from an anonymous email address requesting the same information, said spokesman Stephen McCausland. Adrienne Bennett, a LePage spokeswoman, said the most recent FOAA request prompted the emergency legislation, which would apply to all pending information requests. State law requires entities that receive a FOAA request to acknowledge receipt of the request “within a reasonable period of time.” Entities that plan to deny all or part of the request have five working days to provide written notice of the denial, including the reason. Ericka Dodge, a spokeswoman for Senate President Justin Alfond, D-Portland, said the measure would enact a block on concealed weapons permit information for 60 days while the Legislature considers another bill, sponsored by Rep. Corey Wilson, R-Augusta, that would permanently exempt concealed weapons permit information from the state’s Freedom of Access Act. The governor on Friday urged lawmakers to suspend normal procedures — under which a bill would first be subject to a public hearing and review by a legislative committee — and move immediately to floor votes by the full Legislature. Dodge said both Democratic and Republican legislative leaders worked out the arrangement with LePage. She said legislative leaders hope to bring the measure up for votes Tuesday, the next time the House and Senate convene. Republican legislative leaders Friday praised the Bangor Daily News for withdrawing its request for concealed weapons permit information. But they voiced concern about the similar anonymous request, which didn’t indicate how the individual or group making the request intended to use the requested information. The BDN indicated in its Freedom of Access Act request that it didn’t intend to publish the information it received from law enforcement agencies or municipalities.